Co-dydramol is a compound painkiller which contains paracetamol and dihydrocodeine. Paracetamol is the most well known and widely used analgesic. It suppresses pain and, in addition, reduces fever. Dihydrocodeine belongs to the class of medicines called opioids, a weak morphine derivative. It blocks the transmission of pain signals in the central nervous system. When combined, paracetamol and dihydrocodeine form a powerful painkiller which helps to relieve pain fast. Co-dydramol is used to relieve fever symptoms and moderate pain when other (milder) painkillers do not work well enough. It is prescribed to treat the flu and common colds (with coughing), headache, menstrual pain, toothache, muscle and rheumatic pain, nerve pain, post-operative pain or pain from illness, and is also used to manage pain from different causes. Co-dydramol should be taken whole orally with a glass of water, preferably during or after meals. Co-dydramol works fast, but its effect is temporary. If you want to take another tablet because the effect has worn off, be sure to leave at least four hours in between doses. See the package leaflet for more information on how to use Co-dydramol. 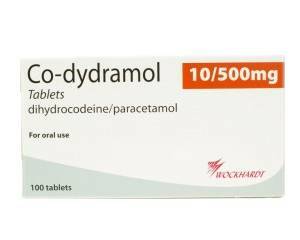 Co-dydramol contains 500 mg paracetamol and 10 mg dihydrocodeine per tablet, and is available in packs of 100 tablets. The usual dose for adults and children aged 12 and over is one or two tablets every four hours, with a maximum of eight tablets a day. It is important not to exceed the dose recommended by your docter. Co-dydramol is not suitable for children under the age of 12. Co-dydramol should only be used with your doctor's approval if you are pregnant, want to become pregnant or are breastfeeding. Co-dydramol may cause drowsiness, dizziness or sleepiness. Use caution when participating in traffic or operating dangerous machinery. Alcohol intensifies the effect of Co-dydramol, causing increased drowsiness and dizziness. It is advisable to reduce or stop alcohol consumption when taking this painkiller.